The following piece is cross-posted from our partners at the CDA Institute as part of an ongoing content sharing relationship. You can read the article in its original form here. CDA Institute Analyst Ariel Shapiro comments on the proliferation of submarines and issue of sea denial in the Asia-​Pacific. In 2013, Major General Zhang Zhaozhong, an outspoken senior official in the Chinese People’s Liberation Army, described China’s strategy in the South China Sea by referring to a cabbage. In regards to the Scarborough Shoal, a group of rocks disputed by China and the Philippines, the Chinese strategy is to inundate the area with a large fleet of military and commercial ships of all sizes, to surround the contested rocks like the layers of a cabbage. What essentially amounts to a blockade, disguised by friendly vegetarian metaphors, is a manifestation of the more assertive Chinese foreign policy undertaken by President Xi Jinping. In this post, I will discuss how the recent build-​up of regional naval fleets in Asia is a response to China’s increasingly assertive policy – and why this is cause for concern for China. In recent years, there has been a buildup of military submarines in the Asia-​Pacific, which Michael Wesley at the Australian National University refers to as a “bonanza.” Despite multiple changes in leadership over the past few years in Australia, the massive project to replace the Royal Australian Navy’s six aging Collins-​class submarines with 12 new state of the art diesel submarines is still well underway (as a point of comparison, Canada currently has four Victoria-​class submarines, three of which are operational, and all of them several years older than the submarines Australia is replacing). 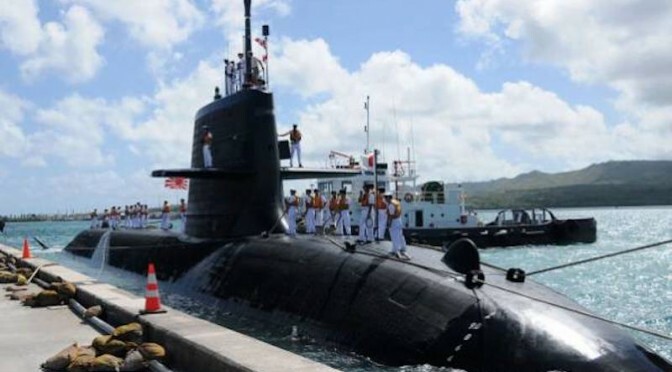 The Australian submarine procurement process brings to the forefront the changes that are happening in another key player in the Asia Pacific region: Japan. For the first time since the 1960s, new legislation in Japan permits the country’s world-​renowned industry to export military technology. The top contender for the contract to replace the Australian submarines is the Soryu-​class, developed by Japanese giant Mitsubishi. The Soryu-​class diesel submarine is notable for its air-​independent propulsion technology, which allows the vessel to remain underwater without surfacing for significant periods of time compared to other diesel submarines. Japan, of course, is not only developing the submarine for export; it is in the midst of increasing its total submarine fleet form 16 to 22. Australia is not the only country in the region increasing its submarine fleet. In September 2015, the Indonesian House of Representatives announced a plan to purchase two Kilo-​class submarines from Russia; the nation comprises 17,000 islands, and senior military planners estimate that the country needs at least 12 submarines to adequately patrol its territorial seas. Across the Strait, Lieutenant-​Colonel Aaron Beng of the Singapore Armed Forces analyzes submarine procurement in Asia from his country’s perspective. He notes Singapore’s recent acquisition of two Vastergotland-​class submarines from Sweden, bringing the fleet’s total to six; the refurbishment of two French Scorpèné-​class submarines by Malaysia; and the ongoing purchase by Vietnam of six Kilo-​class submarines from Russia. One can also include the new Thai ruling military junta decision to purchase submarines from China. Not to be outdone, the first of India’s six new Kalvari-​class diesel electric attack submarines, based on the French Scorpèné, are currently undergoing sea-​trials. What is the motivation for this submarine acquisition? The submarine is, in terms of dollar-​per-​value, the best tool for sea denial. This maritime strategy is an asymmetric one. Instead of great powers building up fleets to fight for control of the seas, as was the case in the lead up to the First World War, sea denial is a strategy used by weaker powers to deny access to their coastal areas by larger powers; the maritime equivalent of guerilla warfare. Essentially, a small, stealthy, relatively inexpensive submarine can pose a serious threat to an advanced aircraft carrier or major surface combatant. For example, Singapore’s submarines will add to its defence posture of the “poison shrimp”; while the Republic has neither the ambition nor the capacity to control the seas, it does indeed have the capacity to cause significant damage to a larger power that would attempt to threaten its vital interests (which, due to its small size and the global nature of its economy, include shipping), much like eating a poisoned shrimp can make a much larger animal very ill. As Peter Briggs at the Australian Strategic Policy Institute notes, navies have submarines not only to serve in a potential war, but for “situations short of conflict” – their mobility, endurance, stealth, and payload make them an essential tool in preventing conflict through deterrence. This brings us back to China and the cabbage strategy. In the South China Sea, despite the unresolved nature of competing claims over various small islands, China is continuing with its policy of reclaiming land and building infrastructure. Last week, tensions flared as the USS Lassen, an American destroyer, sailed in what Washington claims are international waters but which China considers within its territorial sea. While the US Navy (USN) remains the most advanced and important navy force in the Pacific Ocean, China’s growing fleet of advanced surface and undersea ships gives it a sea denial capability against America’s more formidable force – especially when combined with its on-​shore anti-​access and area denial (A2/​AD) assets. Smaller countries in the region are eager to build up their own deterrence and sea denial capacity to protect their shipping lanes and vital interests in an era where the United States can no longer underwrite global maritime security, and submarines are perhaps the best way to do so. While this strategy is aimed primarily against China, Beijing, in turn, is building up its own fleet towards a strategy of sea denial against the more powerful USN. However, China has also increased the responsibilities placed on its forces and has turned otherwise uninvolved actors into maritime rivals. In addition to asserting its primacy over its coasts and capacity to dominate Taiwan, which remains at the core of China’s security policy, it now also actively seeks to assert Chinese freedom of maneuver over the South China Sea and eventually rival American control of wider areas of the Pacific Ocean. While much has been written about the Sino-​American rivalry in the Pacific, the role of smaller Southeast Asian countries is too often forgotten. The USN is still far superior, for the time being, to the Chinese People’s Liberation Army Navy. Yet any assessment of the strategic balance must take into account other important players in the region, such as Australia, Japan, Singapore, India and Vietnam, all of which are showing a tendency to bandwagon with the United States – making any potential Chinese dominance even less foreseeable. At a recent conference at the University of Ottawa, Professor Jean-​Pierre Cabestan, one of the foremost French experts on China, noted how Chinese President Xi Jinping’s success in making China more assertive on the world stage has only provoked a “rebalancing” of the United States and its allies towards China. Indeed, if the cabbage strategy continues to cause horizontal proliferation (the number of countries building up military capacity) as well as vertical proliferation (pre-​existing powers increasing their capacity, such as the development of new missile systems on littoral combat ships in the United States), China’s aggressiveness may have caused it to lose more influence than it has gained. Ariel Shapiro recently graduated from McGill University in political science and economics and is currently an Analyst at the CDA Institute.